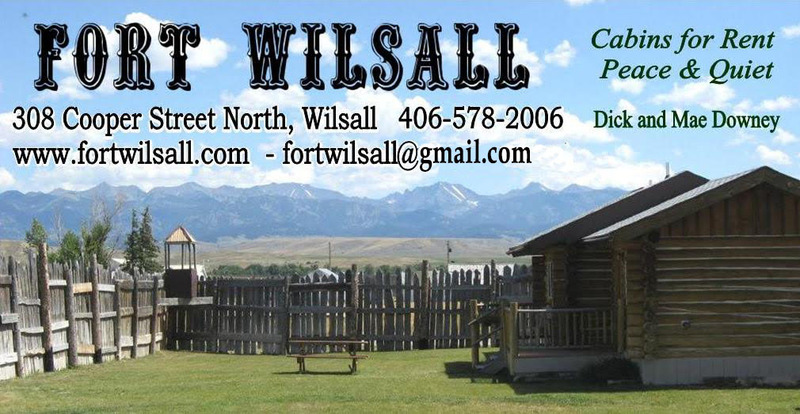 Fort Wilsall is located in the beautiful Shields River Valley. The Shields Valley is nestled between the Crazy Mountains to the east, Bridger Mountains to the west and the Absaroka Mountains to the south with the Shields River, one of the prime trout streams in Montana, meandering through the Valley. Located directly in the Shields Valley River Basin, home of the oldest archeological dig in North America, is the Anzick Site, dating back 11,500 years ago. In 1968 it was discovered the late Ice Age People left over 100 red ocher covered stones and the bone artifacts of a two year old child at the most prominent land feature in the center of the Shields River Valley floor located near Wilsall, Montana. Wilsall - Home of Val's Deli (as written in Meredith Brokaw's cookbook "Big Sky Cooking") and the Ringling 5. Legendary skiing Bridger Bowl Ski Resort, half hour away from Wilsall. Wilsall is located in south central Montana, in Park County, between Livingston and White Sulphur Springs on US Highway 89. It is named after the son [Will} and daughter-in-law [Sally] of Walter B. Jordan, who platted the townsite. It is a quaint town with a population of two hundred plus. Skiing (downhill and cross country), sledding, and snowmobiling are available in the winter. Mountain biking, horseback riding, excellent trout fishing, golfing, legendary hunting, guided backpack tours- plus numerous hiking trails are summer/spring and fall activities. The combination make Wilsall a year round destination for vacation goers. There is also shopping and a multitude of gourmet restaurants available in nearby Livingston and Bozeman. Or, you can relax at Fort Wilsall with a book from their extensive library.